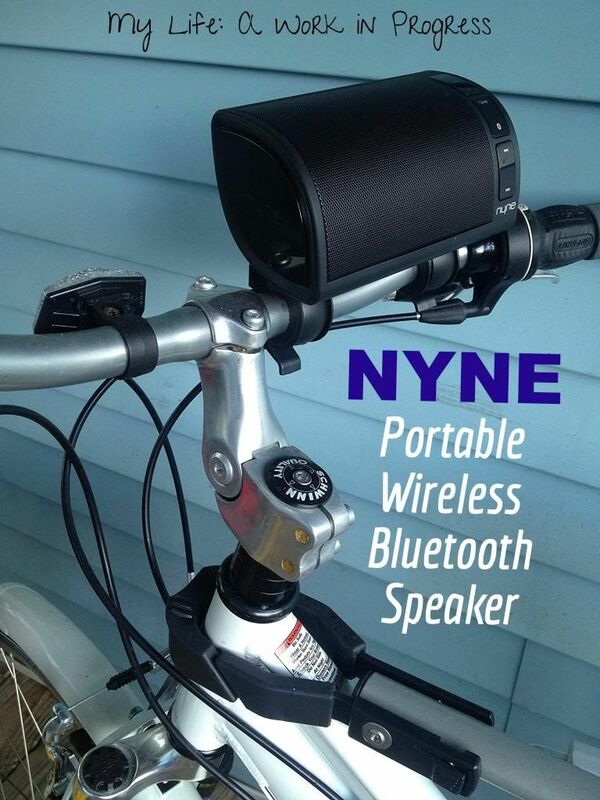 I was thrilled to receive the NYNE NB-200 Portable Wireless Bluetooth Speaker with bike clips to review. The timing was perfect, since Hubby and I had just purchased bicycles for ourselves and a bike seat for Baby J. Not only that, but a friend had asked if I’d like to ride with her in a 30-mile charity event in the spring. With all the riding and training I’ll be doing now, the speaker will come in really handy. I’m not going to give you all the dimensions and specs for the NYNE NB-200 Portable Wireless Bluetooth Speaker, because I think it’s easier for you to just click on the link and check out the site’s description of the speaker. But I will say the speaker has a built-in microphone with noise cancellation, so you can pair it to your phone and talk with someone hands free. 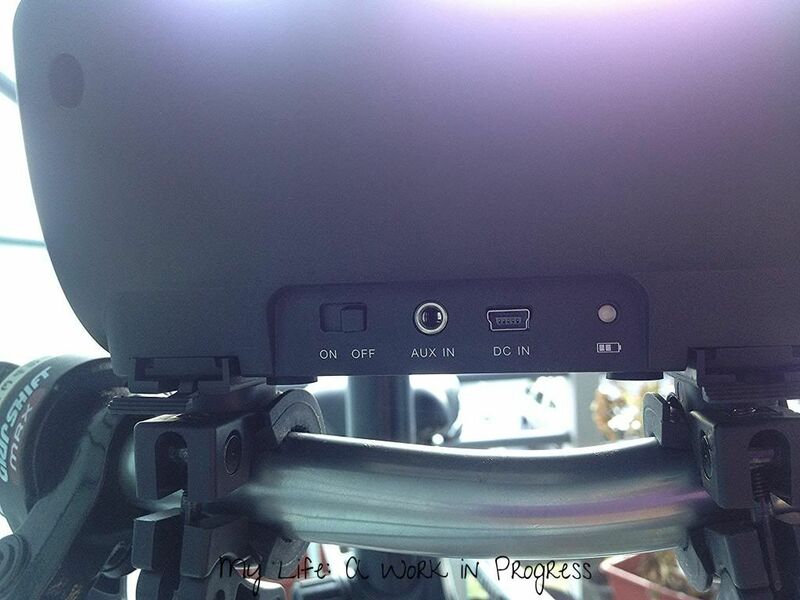 Also, the speaker is compatible with smart phones, BlackBerry, iPhones, iPods, and iPads. It comes with a USB charging cable, so you can charge it from your laptop or desktop. We also have a USB/wall adaptor (I don’t think that’s the technical term, sorry) that we can use with it. The battery lasts us around five hours, which, according to their website, is the average. I can easily pick the speaker up and hold it in my hand, but it’s still large enough that it can blast sound, if I want it to. The sound quality is great! It’s very clear and crisp. Even hubby was impressed by the sound. He also liked that it includes a little bag to keep the speaker from getting scratched. The bag’s not padded, though, so it won’t keep the speaker from breaking if dropped. About that…sooooo I did actually drop the speaker on cement outside, but it didn’t smash into pieces, thankfully! It still works as well as before. I’m not planning on dropping it again to continue to test my theory, but it seems quite sturdy. My favorite part about this speaker would have to be the bike clips. The speaker is definitely for more than just bicycles; in fact, as I’m sitting on my bed typing this, the speaker is next to me, playing music from my iPhone. BUT the fact that I can attach it to my bike is pretty cool. I followed the instructions to attach it, and the process was easy. I can actually leave the clips on my handlebars and just slide the speaker off of the clips when I want. This is nice if I want to leave my bike outside of a store or next to the playground. I can take the speaker off and put it in my purse or diaper bag. 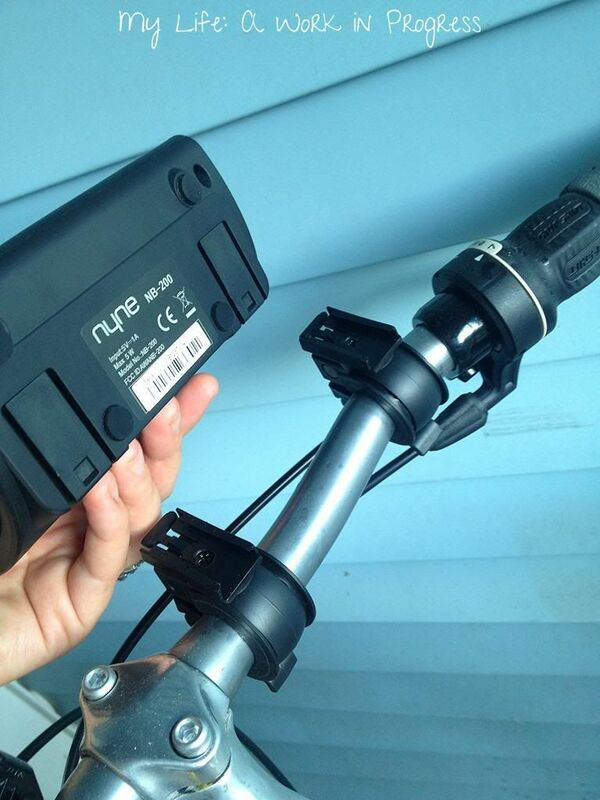 Then since the clips are already attached to the bike, the speaker is easy to get back on. This speaker will actually attach to strollers, but the area it attaches to has to be the same size as bike handlebars or smaller (in my experience). I tried it on three different strollers- a light weight stroller, a regular stroller, and a jogging stroller. The foam grips that come on most stroller handlebars are too wide for the bike clips to fit over. 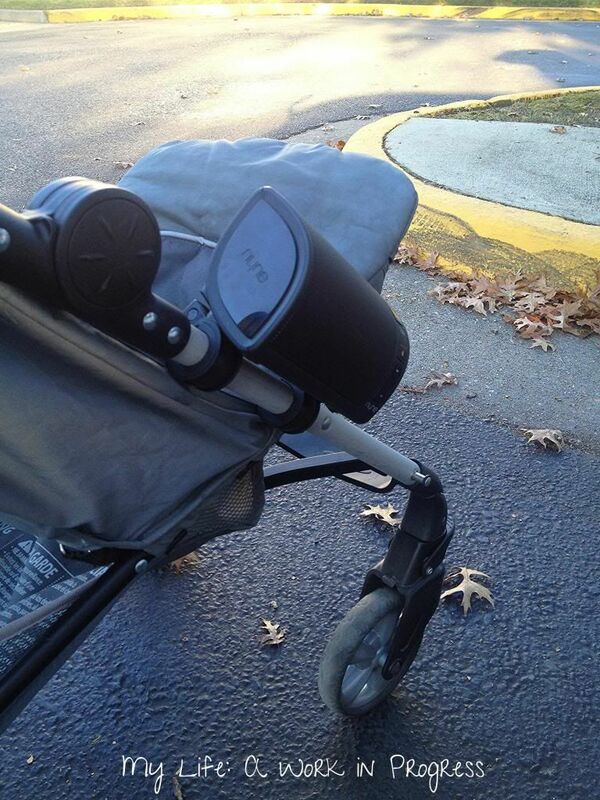 I was able to attach the speaker to the lightweight stroller, but it was further down by the seat. My son actually loved that. The other night we went for a walk around our local lake. I played an “Owl City” album from my iPod, and Baby J just chilled out and listened to the music while he walked. His little feet were kicking away, “dancing.” If I want him to sleep, I play some lullaby tracks. I’m determined to find other areas of his strollers to attach this speaker, especially the jogging stroller for my runs, so check back in a couple of weeks, and I’ll update this post! The only thing I don’t like about the speaker is the little tabs on the bike clips seem flimsy. Every time I remove the speakers from the clips, I’m afraid I’m going to break the tabs. I’m being really careful though. It’s been a few weeks of use, and so far so good! All in all, it’s a great little speaker. 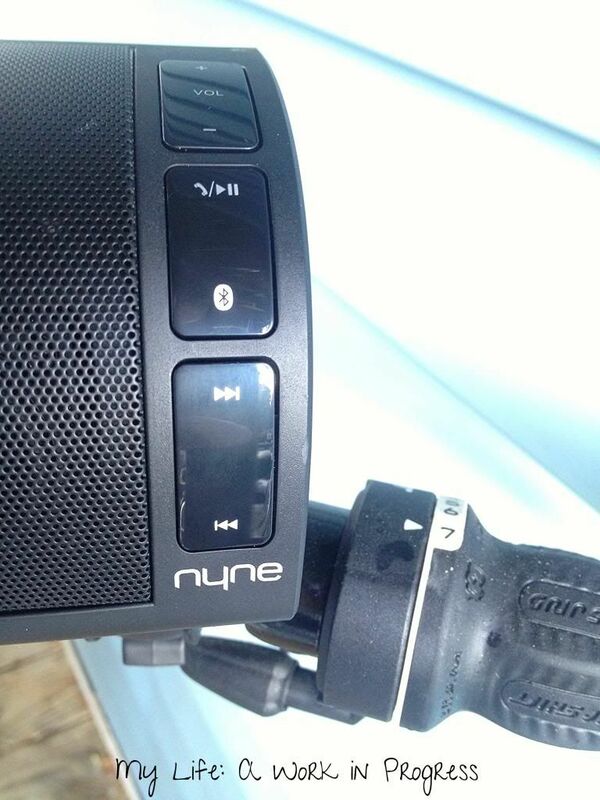 If you’re going to spend anytime on a bicycle, or pushing a stroller, or if you’re just looking for a lightweight, portable wireless speaker with quality sound, I recommend checking out the NYNE NB-200 Portable Wireless Bluetooth Speaker. If you’re a military family, you can now find this speaker as well as other NYNE speakers at AAFES! The NYNE NB-200 Portable Wireless Bluetooth Speaker is also available on (affiliate link>) Amazon . Find them on Facebook and Twitter for updates and giveaways. Wow! That looks pretty neat. I love that you can connect it to a bike or stroller. It’s so great that someone is making a speaker wireless & bluetooth! My son would LOVE this! He loves riding his bike with his iPod, but I don’t like that it blocks out all other sounds (i.e., car engine, a horn honking). So, best of both worlds. I think I need this just so i can hear my phone ring when im outside or the kids are noisy. Hm… Ill bet it would work on the tractor. I love it. I like that I can talk on my phone with it. I like the noise reduction. I just like it 🙂 Great review!! As the technology increasing day by day there are many innovation . Wireless technology is very widely became popular. The above wireless speakers are the best one in it . It provide great portability . We can use during biking with clear music . It has nice connectivity with our player . Pingback: Bluetooth Speaker Giveaway - Enter Today!